Inspired Closets is a locally owned and operated business specializing transforming spaces with custom home storage solutions for practically every area of your home or business. Since 2003, we have been committed to enhancing the quality of your life creating meaningful storage solutions. We LOVE designing closets, but we also provide practical and affordable solutions for other areas of your home. We can help with all of your storage needs. We also provide commercial solutions for hotels, retail stores, healthcare and educational facilities, spas and salons. Our work has taken us as far north as Prudhoe Bay and as far south as Juneau. 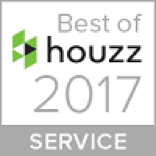 Only 3% of Houzz professionals receive this distinction.